Valentine's is coming soon and some of you might be already looking for romantic places for dinner. Equinox might be one of the most romantic "special occasions" restaurants in town. 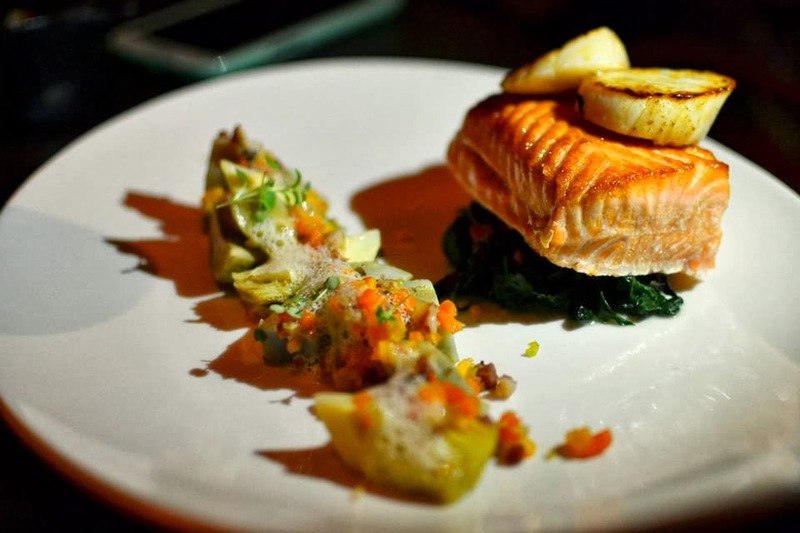 It has been around since ages, before other popular newer names for high end date restaurants. I believe the distinctive point of Equinox is its location at the 70th floor of the Swissotel Stamford Hotel, giving a spectacular view of Singapore river and Singapore famous skylines such as the Marina Bay Sands, Fullerton Hotel, Esplanade, and Singapore Flyer. My girlfriends and I were looking for a special restaurant for a "girls night out" to end the year. Coincidentally, Equinox had a 10% off all food items from the Singapore Airlines Boarding Pass privillege, and one of us had just fly Singapore Airlines. It was a Thursday night and we made a reservation the previous Wednesday. Unfortunately we were not able to get any window tables. If you were lucky enough to reserve a window table, an extra charge of $20 will be added to your bill. When we entered the restaurant, the ambient was calm, soothing, romantic, yet breath-taking. The view from up there at night was definitely spectacular. Five of us were seated at a booth on the corner. 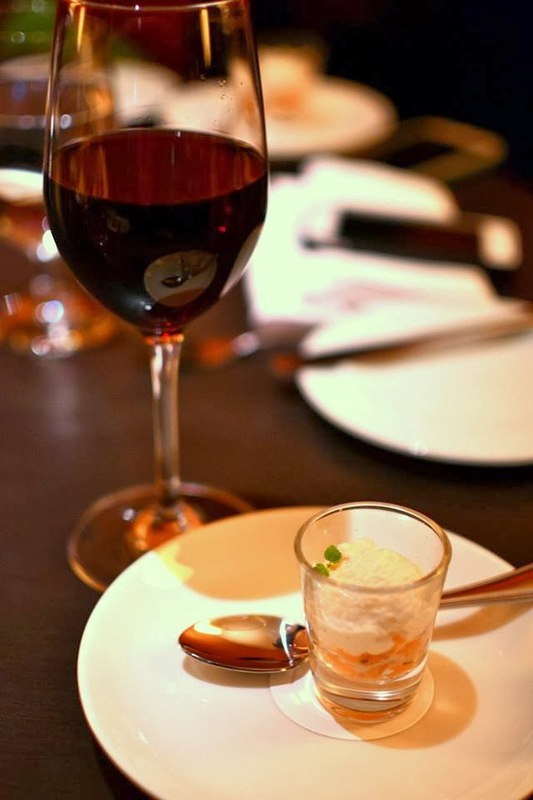 We were given an amuse bouche to amuse our palate: the Salmon Tartare with Bonito Foam served in a shot glass. The Salmon Tartare made my tastebud happy. It was a cleverly concocted amuse bouche that I liked a lot. It had a mild fresh salmon taste with a sweet and smooth bonito foam. Perfect taste! After placing our order, we were given a selection of house breads to choose from. There were: olive bread, onion and cheese bread, mini baguette, and another bread I did not note down. I selected all four types of bread along my meal! 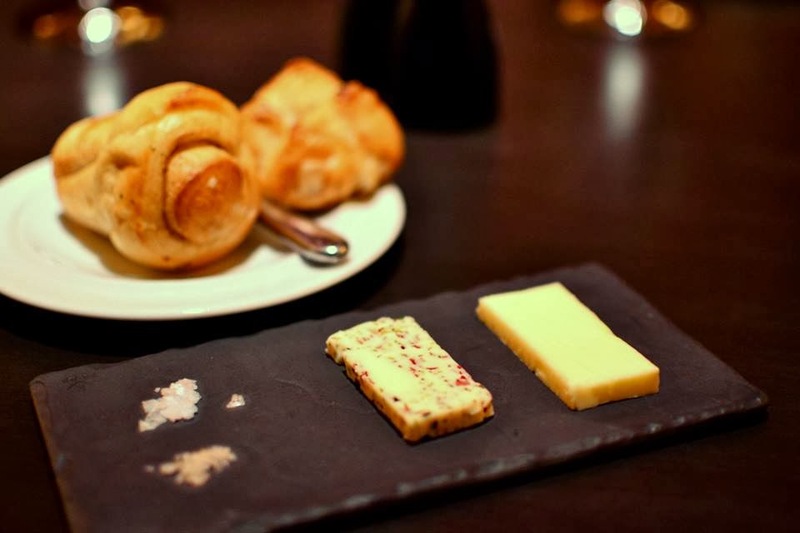 I love the olive bread and I love how they gave us two types of butter: regular and herb, with two butter salts. 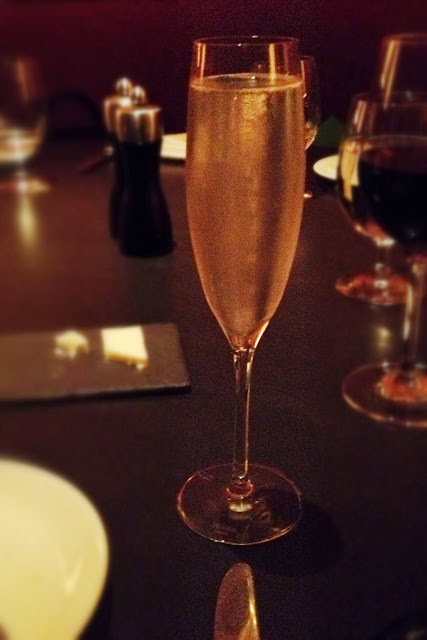 To booze up the night, I asked for a Lychee Bellini ($20), which was good in my opinion. All of us decided to skip the appetizer and go straight to mains. For my main course I ordered the Slow Cooked Iberico Pork Belly ($58). My friends ordered the Roasted Salmon ($60) and Tenderloin. When our dishes came, from the presentation I immediately regretted not ordering the tenderloin. My Pork Belly was slightly poor in presentation because of the pistachio spread. It looked sloppy and gross. The pork was very tender, juicy, and succulent. However, the acid on the plate was just missing. 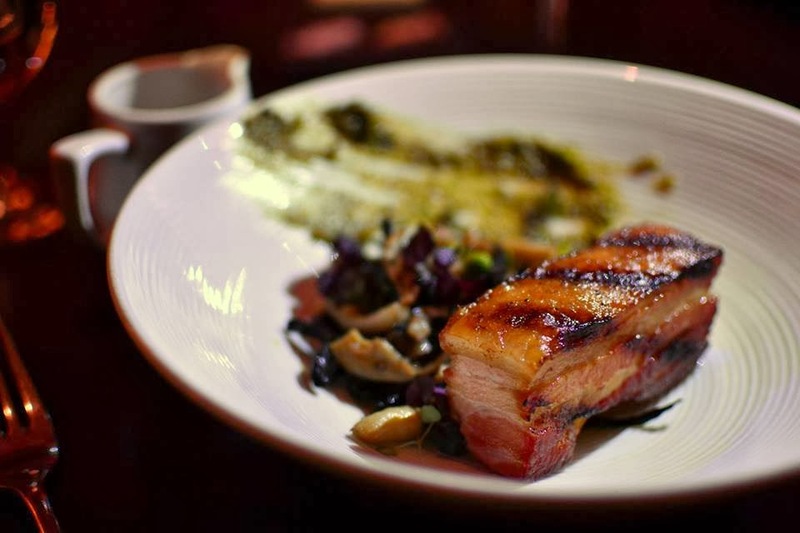 The pork, the mushroom, the bacon dashi, the pistachio puree - all of them adds to the fat. After 2 to 3 bites, I started feeling "tired" of my dish. The pistachio puree could've been swapped with a cauliflower lime puree. Or some macerated fruits like peach or cherry could've been added to balance the whole dish. The Roasted Salmon was pretty on the presentation. And definitely this was a more balanced dish, although another important component is missing - the sauce. Yes! The sauce! The dish had seared salmon, scallops, blanched spinach, and artichoke barigoule. But nothing blended all of them together. Thus everything became bland. Unfortunately, the salmon was slightly overcooked thus leaving it dry. Not a crowd pleaser. The star of the night was the Tenderloin ($58). First of all, presentation was a winner. It was served on a stone topped wooden board, with three other components: our choice of dressing in a mini cassole, grilled bone marrow (really! ), and grilled carrots. For the dish, we were also able to choose two sides that came in small cassole on the side. 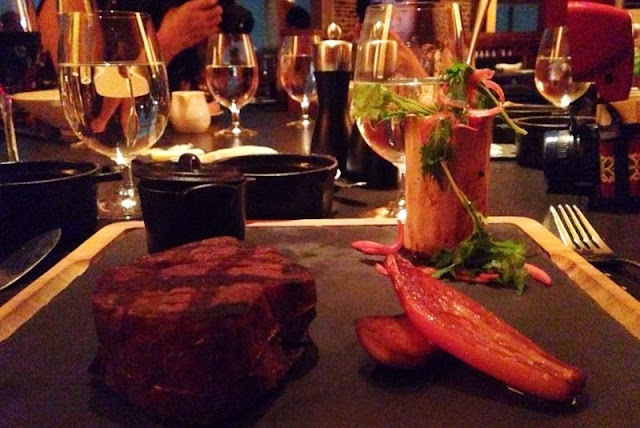 Needless to say, my friend ordered her steak medium well - I had a bite and it was so tender yet juicy I was in an awe. I would definitely come back to Equinox just for the tenderloin. At the end of our mains, we were way to full to order desserts. Our experience at Equinox was very pleasant. Our waiter was friendly and attentive. There was never once we had to ask for our water to be refilled, which was a rare occurrence in Singapore. After the meal, he gladly took our group picture and even made us pose by the window overlooking the great scenery. We had a good time in Equinox, and I would definitely return to eat the tenderloin.